Today, it is clear a new wave of organized, state sponsored, espionage is targeting commercial and federal information systems with continuous long term attacks. Most vendor countermeasures are promoting anti-malware AV & simplistic IP level firewall solutions to protect client or endpoint computer systems with access to the network. This focus has proven largely ineffective as adversaries typically test against major AV packages prior to launching attacks resulting in high client infection rates. This puts more emphasis on application level security to protect information- even after client infection has occurred. 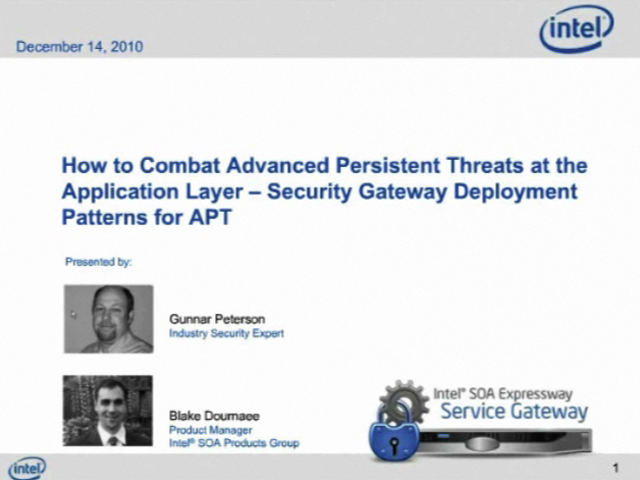 In this technical webinar, independent federal security expert Gunnar Peterson explores how a Security Gateway, deployed at the network edge can deliver deeper inspection of XML based web service traffic for advanced APT threat identification, attribution, and proactive monitoring.